JAKARTA (Reuters) - Some of the Indonesian men arrested at the weekend after tip-offs that they were planning a string of militant attacks had received funding from Syria, hardening evidence of their links to Islamic State, police said on Monday. Officials said the raids in five cities across the island of Java, during which nine people were detained and bomb-making equipment was seized, may have foiled plans to target New Year celebrations. Police said they remained on high alert, underlining concern about a resurgence of militant attacks by Indonesians who have returned from fighting with the radical Islamic State group in Syria. "They received transfers of funds ... they have a connection with Syria," national police spokesman Anton Charliyan told a news conference. "What we gather so far is they are linked to the ISIS group," he said, using a common acronym for Islamic State. "They got the money from a senior ISIS figure who works as a coordinator to link ISIS to Indonesia." Police suspect that four of those arrested belonged to the al Qaeda-affiliated Jamaah Islamiah group. Media reports on Sunday said some of the men had planned to launch attacks in Java and neighboring Sumatra island on Shia Muslims, who represent a tiny minority in Indonesia. Indonesia has the world's largest Muslim population, the vast majority of whom practise a moderate form of the religion. Charliyan said the militants appeared to be planning attacks on certain public locations, government and police officials and "those considered enemies of ISIS", but gave no details. 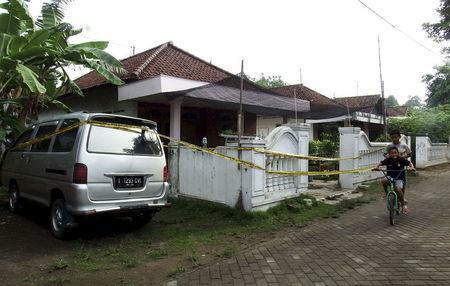 At one home raided in Central Java, officials found bomb-making material and instructions, books about jihad, a map of Jakarta and electronics. Authorities plan to deploy about 150,000 security personnel to safeguard churches and other places around the country during Christmas and New Year celebrations. Security and surveillance had already been stepped up in some areas following last month's attacks in Paris, which Islamic State claimed responsibility for. Media reports said the Java raids were prompted by intelligence from the U.S. Federal Bureau of Investigation and the Australian Federal Police. "This is a problem that both of our countries are very vulnerable to," Australian Attorney-General George Brandis, who is visiting Indonesia with Justice Minister and counter-terrorism czar Michael Keenan, said after talks with Indonesian counterparts. "It is important that we cooperate with one another in sharing intelligence, in operational cooperation, in technical cooperation, in sharing what we have to learn from one another in order to combat a common threat."